Our customer service reps are available Monday through Friday to assist. 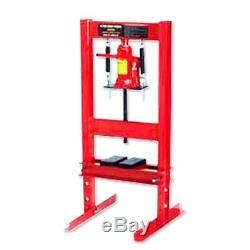 12 Ton Hydraulic Floor Standing Shop Press. Floor Standing Open Front and Rear Design. 12 Ton Ram or 24000 LBS. Spring Loaded Retracting Ram Carriage. 3" - 30" Adjustable Press Table. 17 Working Width between uprights. (2) 6" x 3.5" x 7/8 Steel Press Plates with triangular recesses. Measures 53" x 21" x 22 and weights 92 Lbs. Please note that transit times do vary. Sorry, no local pick ups. Any return must be in the same condition it was delivered, new & unused, and in the original packaging. It may just be a matter of sending out a replacement part. If there was a mistake on our end, we will make it right! The item "12 Ton Hydraulic Floor Standing Shop Press Heavy Duty Open Front & Rear Design" is in sale since Tuesday, April 22, 2014. This item is in the category "Business & Industrial\Hydraulics, Pneumatics & Pumps\Other Hydraulics & Pneumatics". The seller is "square2box" and is located in Gardena, California. This item can be shipped to United States, Canada, United Kingdom, Denmark, Romania, Slovakia, Bulgaria, Czech republic, Finland, Hungary, Latvia, Lithuania, Malta, Estonia, Australia, Greece, Portugal, Cyprus, Slovenia, Japan, China, Sweden, South Korea, Taiwan, South africa, Thailand, Belgium, France, Hong Kong, Ireland, Netherlands, Poland, Spain, Italy, Germany, Austria, Israel, Mexico, New Zealand, Philippines, Singapore, Switzerland, Norway, Saudi arabia, Ukraine, United arab emirates, Qatar, Kuwait, Bahrain, Croatia, Malaysia, Brazil, Chile, Colombia, Costa rica, Dominican republic, Panama, Trinidad and tobago, Guatemala, El salvador, Honduras, Jamaica, Antigua and barbuda, Aruba, Belize, Dominica, Grenada, Saint kitts and nevis, Saint lucia, Montserrat, Turks and caicos islands, Barbados, Bangladesh, Bermuda, Brunei darussalam, Bolivia, Ecuador, Egypt, French guiana, Guernsey, Gibraltar, Guadeloupe, Iceland, Jersey, Jordan, Cambodia, Cayman islands, Liechtenstein, Sri lanka, Luxembourg, Monaco, Macao, Martinique, Maldives, Nicaragua, Oman, Peru, Pakistan, Paraguay, Reunion.